15 per cent of the world’s population, or more than 1.2 billion people, lives without electricity. Off-grid solutions can provide an estimated 60 per cent of the additional generation needed to plug that gap and achieve universal access. Today, 15 per cent of the world’s population lives without electricity. In Sub-Saharan Africa, that jumps up to two out of every three people. A major drive to bring renewable energy to these 'electricity poor' is underway, but despite the progress made so far, under a business-as-usual scenario around 600 million people will still not have access to electricity by 2040, according to the International Renewable Energy Agency (IRENA). To avoid this, new partnerships and a need to think big about going small in terms of technical innovations seems to be the key. Rural electrification and the supply of off-grid power is a big topic. Big in terms of people living without access to electricity (15 per cent of the world's population - more than 1 billion worldwide) and big in terms of the money needed to plug the funding gaps (we're talking billions of dollars, not mere millions). And yes, it needs big power projects like the large-scale wind projects and solar PV farms we see increasingly coming online around the world. But looming large over the energy access crisis is a big need for small-scale technical innovations in off-grid renewables, backed up with new, innovative financing structures. As Adnan Z. Amin, Director-General of IRENA, says, if the world is to achieve universal access to energy, "we cannot rely solely on large-scale centralised energy projects". Off-grid renewable energy technologies represent "an opportunity for transformative change in the way we approach electrification”, he said at IRENA's Third International Off-Grid Renewable Conference & Exhibition, held in Nairobi, Kenya, (30th September to 1st October 2016). According to Amin, 15 per cent of the world’s population, or more than 1.2 billion people, lives without electricity. Off-grid solutions, he said, can provide an estimated 60 per cent of the additional generation needed to plug that gap and achieve universal access. The advances in off-grid renewable energy development have been impressive from all standpoints, IRENA points out. Large-scale development of community-based micro-hydro and biomass technologies has a long track record. The technology mix has further diversified with the rise of deployment in small-wind and solar PV-based technologies. Today, solar PV-based solutions have gained prominence as costs have declined. Plus, their inherently modular nature makes them ideal for adaptation to local conditions, ranging from lanterns to household systems to village-powering mini-grids. 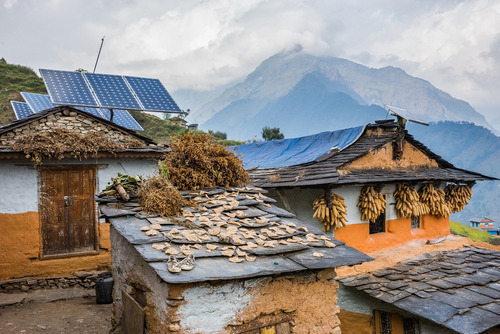 According to IRENA, off-grid renewable energy solutions are "no longer a fringe option" for expanding access, and their role within a national strategy to reach universal access in a time-bound manner should be recognised. "The question is not whether universal access will happen through off-grid solutions but rather how do we make it happen quickly enough?" Amin said. Rachel Kyte, CEO for Sustainable Energy for All (SEforALL) and Special Representative of the UN Secretary-General, agrees. "It’s possible to secure sustainable energy for all by 2030. But we are not on track," she says, commenting on the release of the third edition of the SEforALL Global Tracking Framework (GTF) report, which was launched at the Sustainable Energy for All Forum in April. " Many countries are taking action, but the world as a whole is not moving fast enough. We must all go further, faster—together." This year's GTF report shows the increase of people getting access to electricity is slowing down, and if this trend is not reversed, projections are that the world will only reach 92% electrification by 2030. IRENA's report concurs with these findings, adding that "under a business-as-usual scenario around 600 million people will still not have access to electricity by 2040". The GTF report acknowledges that investments in renewable energy and energy efficiency globally have each climbed to an estimated $250 billion a year. However, to allow progress to move at the speed and scale needed to reach universal access by 2030, the GTF report estimates renewable energy investment would need to increase by a factor of 2-3 and energy efficiency by a factor of 3-6. It adds that a five-fold investment increase is needed in energy access/electrification projects, noting that 80% of those without access to electricity live in just 20 countries. "This new [GTF] data is a warning for world leaders to take more focused, urgent action on access to energy and clean cooking, improving efficiency and use of renewables to meet our goals," Kyte said. "While we are making some progress - with many of the technologies we need available and policy roadmaps increasingly clear - it's not enough." To accelerate the pace of off-grid renewable energy deployment, many different building blocks have to come together. "There are no one-size-fits-all solutions." Policy makers have a significant role to play, naturally, but as Andrew M. Herscowitz, Coordinator of Power Africa says: "No single actor is going to make [achieving universal energy access] happen. Partnerships will be key to accelerate the pace of energy access." Run by government agency USAID, Power Africa is a five-year American presidential initiative launched by President Barack Obama in Tanzania during his Africa Tour in July 2013. It's aim is to enable electricity access by adding 60 million new electricity connections and 30 GW of clean power generation. That goal could be well exceeded. The Power Africa Tracking Tool (PATT) - which tracks power projects where information has been made public - shows 430 transactions totaling 33.67 GW are currently progressing through the development pipeline. However, the organisation says that internally it is actually tracking approximately 700 transactions that have the potential to add over 70 GW. Formed in 2006 with the goal of enabling widespread adoption of renewables through lowest cost clean energy storage technology, Fluidic Energy was named as a 2017 New Energy Pioneer at the annual Bloomberg New Energy Finance Summit in April. The company supplies rechargeable zinc-air batteries – an alternative to lead-acid and lithium-ion for energy storage – and off-grid rural electrification solutions. To date it has deployed more than 100,000 batteries in 10 countries, impacting nearly four million people and thousands of communities. Installations extend across rural electrification, telecom, critical power and residential and light commercial applications. Complementary efforts are also needed to build adequate capacity across the value chain (e.g., financing institutions, communities) and identify cross sector-linkages (e.g., productive end-uses such as health care or agriculture) to further enhance the sustainability of interventions. When each of these elements comes together, deployment can be accelerated in a manner that maximises socio-economic benefits.